This is command to the believers! Our ‘walking’, our behavior, our way of life should be totally in the Spirit and not lead by emotions or by the lust of the eyes. What does it mean to walk circumspectly? The answer is simple: walk like a cat! 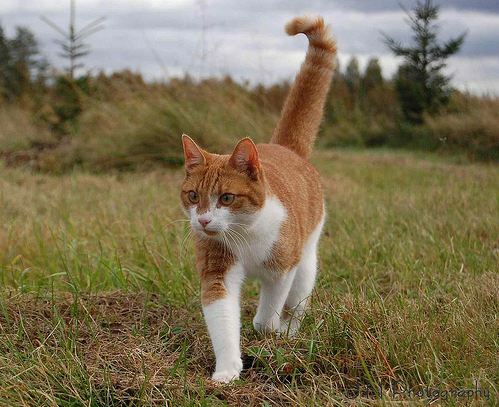 Have you seen a cat walking on dirty or wet ground? She hates it! She is set to remain clean, wisely choosing her steps. She walks carefully, slowly, looking where to place each foot, jumping over if the place is too soiled…At the end of the journey, her body and even her paws are still clean, compared with the road she had to pass thru. At last, she will not rest until every stain is removed by her rough tongue. You may not like cats like I do, but please accept this: cats are always clean! This world is full of sin. Some believers boast that they can go anywhere and visit anyone, no matter how corrupt or wicked. If the Lord sends you with a message to ‘the red district’ or to ‘the mafia headquarters’, then go with faith and you shall be protected. But if the center of your spiritual journey is a mixture of religion, adventure and material gain, you will not be protected from the corruption of the flesh and from the unclean spirits ‘urinating’ on you. Your white clothes shall be soiled with lust, greed and deception. You shall lose your ‘virginity’ to satan, just like Eve lost hers. You shall hate the light for exposing your stains and run towards darkness like unto a friend. It is only true confession and repentance, the deep work of the Cross that can change the heart. It is only the Blood of Jesus that can cleanse these stains of mockery and shame. Be wise therefore! Even a stray cat knows how to avoid dirt! This entry was posted in Uncategorized and tagged confession and repentance. ← In Christ- all God’s promises are fulfilled!